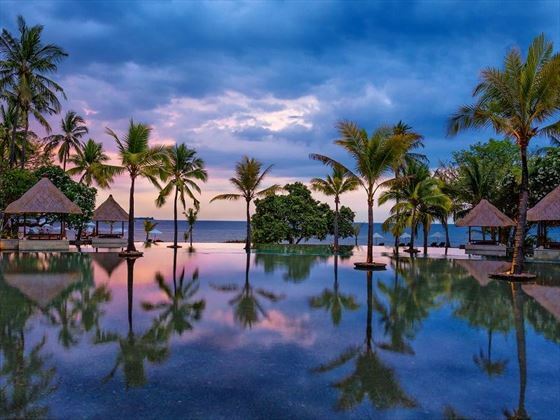 The 5 star Oberoi Lombok resort exudes modern luxury, combining the very highest levels of personal service with natural beauty and a warm equatorial climate. Ideal for both families and romantic getaways alike, the Oberoi Lombok offers an array of the finest accommodations, dining and recreational facilities. 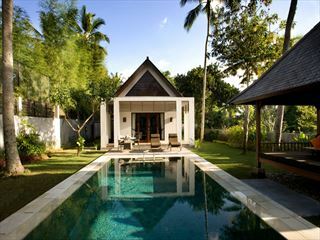 Terraced pavilions and thatched villas provide luxurious quarters to relax and make yourself at home. 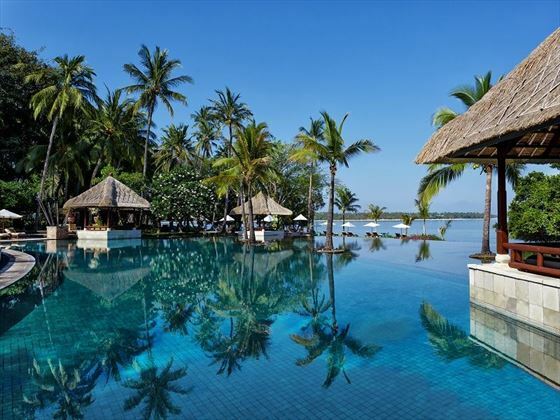 The 40 metre infinity pool provides the resort’s centrepiece, surrounded by fishponds, reflection pools and spacious courtyards brimming with coconut trees and bougainvillea shrubs. The resort also offers a private pier for offshore exploration and a secluded private beach – ideal for collecting seashells. 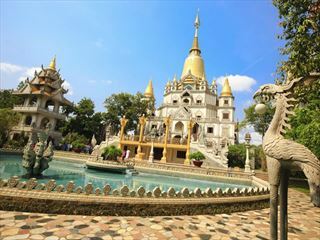 The resort abounds with things to do, offering a fully equipped fitness centre, tennis court and croquet for the more active, whilst wood carving and Indonesian art classes cater for creative types. You can even feed the host of colourful fish from the resort’s pier. From here it’s a short 10 minute ride out to nearby tropical islands awash with palm trees and home to nesting sea turtles. A beautifully set breakfast café is ideal for early morning ocean views whilst the beachside cocktail bar is the perfect place to relax and take in the sunset. 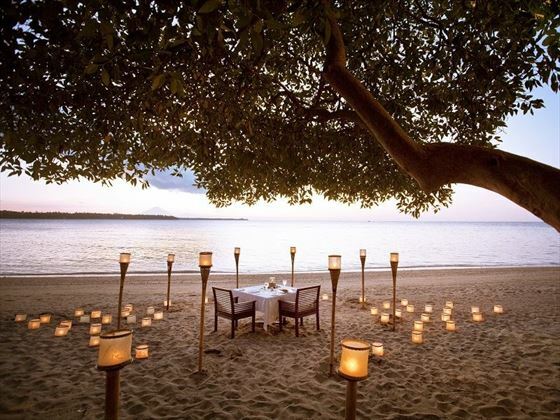 Indonesian, continental or Asian fine dining awaits at the main restaurant, whilst on the beach, a more romantic, candlelit tented option is available. 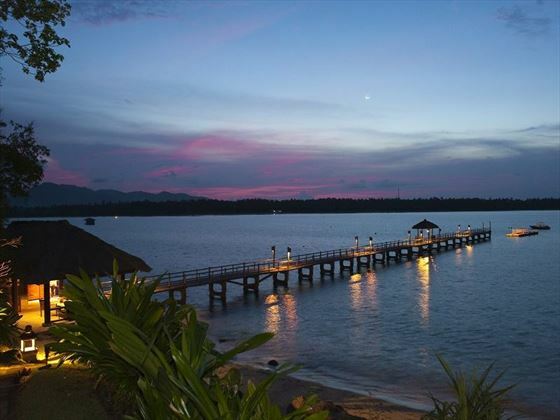 Occupying 24 acres of lush tropical gardens, the Oberoi Lombok overlooks the crystal clear waters of Medana Bay. The property is set around 2 hours’ drive from the airport on the Island’s secluded northwest coast, ideally located for the snorkelling paradise of the Gili Islands just a 10 minute boat ride away. Relax in a luxuriant poolside cabana or enjoy a perfectly prepared mojito as you take in the warm ocean breeze and stroll the soft sands of the resorts secluded beach. Pura Lingsar Temple is Lomboks’s most celebrated religious site or otherwise visit the spectacular Narmada Water Palace. Luxury Pavilion - Garden View - These beautifully appointed Pavilion rooms offer a spacious 90 Sq M of accommodation with a secluded 18 Sq M terrace, perfect for relaxation and open air dining. Furnished with luxuriant teak furniture throughout these traditionally thatched rooms feature a two poster king sized bed. The private terrace is accessed through bright glass doors whilst the bathroom affords tastefully appointed sunken marble baths providing views over the room’s private courtyard and lotus pond. Luxury Pavilion - Ocean View – These spacious 90 Sq M traditional thatched rooms offer spectacular ocean views and come with full length glass panelled sliding doors that open onto the private 18 Sq M terrace. Traditional teak furniture and handpicked artworks are featured providing an upscale finish throughout. 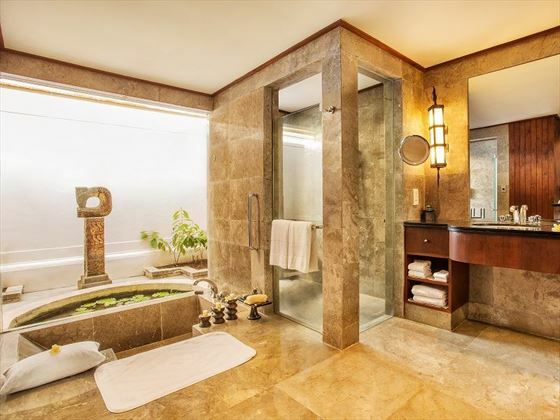 Featuring views of a private courtyard and lotus pond your sunken marble bath offers luxurious relaxation. Luxury Villa – Garden View – Relax on the room’s canopied king sized bed or relax and unwind on a sun lounger in your exclusive courtyard set against its lush tropical surroundings. These beautifully appointed thatched villas feature natural stone walls and offer an expansive 255 Sq M of living space. Constructed using natural materials and soothing teak the space is adorned with traditional carved wood artworks and handmade fabrics. Luxury Villa – Ocean View – Offering unparalleled Ocean views out through the full length glass panelled doors this spacious 255 Sq M villa features natural materials and calming tones combined with luxuriant teak woods throughout. 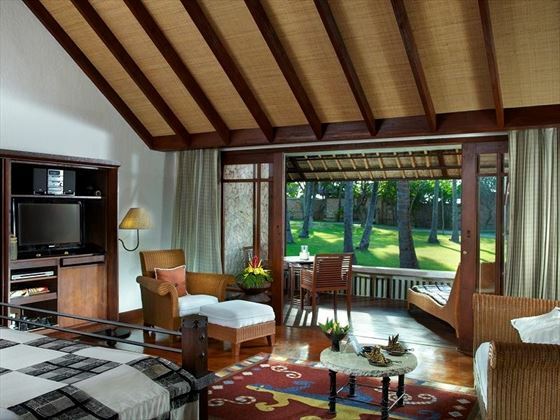 Relax in the canopied king size bed as you take in the sounds of the nearby tropical jungle. The private courtyard is ideal for unwinding and enjoying the warm ocean breezes. 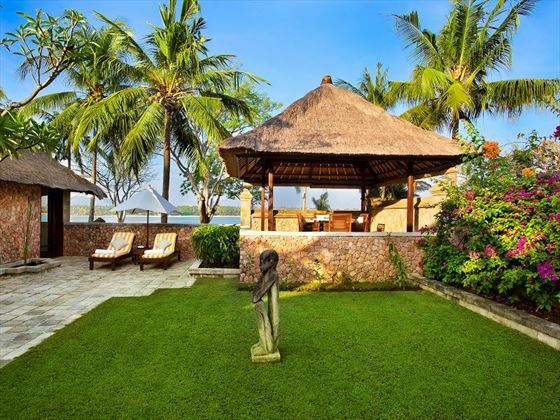 Luxury Villa – Garden View with Private Pool – This magnificent 255 Sq M thatched residence boast a luxurious canopied king sized bed and is tastefully decorated throughout with natural fabrics and local hand carved furnishings and artwork. The villa offers a sparkling 8 x 5 metre swimming pool set in the palatian courtyard as well as a raised pavilion area, ideal for outside dining and relaxation. Luxury Villa – Ocean View with Private Pool – Tastefully decorated throughout using natural fabrics and hand carved local furnishings these spacious 255 Sq M villas feature plush king sized canopied beds. Relax and soak in the cool waters of your private pool and enjoy the al fresco dining pavilion with its large terrace for an unrivalled ocean view. Two Bedroom Ocean View Villa with Private Pool – Ideal for families and friends this expansive 375 Sq M villa offers a canopied king size bed in the master bedroom and spacious second bedroom, both offering luxurious en-suite bathrooms each with sunken marbled baths. With thatched roofs, hand carved decor and dark teak furniture these accommodations ooze luxury and sophistication. Head to the private courtyard where you’ll find your very own 10 x 5 metre pool or enjoy the spectacular ocean views from the large private terrace. Royal Villa with Private Pool – Offering truly luxurious accommodation this 375 Sq M villas provides a separate living room, kitchenette and guest bathroom. With a canopied king sized bed and sunken marble bath the villa is decorated with hand carved décor, dark teak furniture and private 10 x 5 metre pool. Relax and dine in the large secluded terrace as you enjoy unrivalled vistas across the ocean. Sunbird Café – This delightful dining café is ideal for enjoying an al fresco ocean view breakfast as you start your day. Featuring an outdoor kitchen you can witness the chefs as they create signature dishes as well as Indonesian and Indian for both breakfast and lunch. Lumbung Restaurant – With an open-sided thatched dining pavilion alongside an open air courtyard, Lumbung promises an exceptional fine dining experience for couples and families alike. The extensive menu offers a varied choice of sumptuous regional, Indian and continental dishes, each loving prepared by top rated chefs. Seafood and fish dishes are particular favourites. Tokek Bar - Sit back and relax as you unwind in this laid-back thatched outdoor bar. Enjoy freshly made classic and specialty cocktails, spirits and wines accompanied by a choice of delicious tapas and international snacks. This is a great place to relax and read a book, enjoy a board game or take in the spectacular sunset over the ocean. 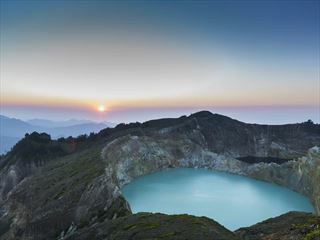 Discover a blissful oasis of breath-taking scenery, rich, ancient culture and a magnificent diversity of native wildlife on an incredible 10-day tour of Indonesia’s ‘Flower Island’ and Komodo National Park, starting and ending in the quaint fishing town of Labuan Bajo, gateway to Komodo Island.